The phonebook hasn't undergone dramatic changes in its new Ice Cream Sandwich attire on the Galaxy S III. It still packs an incredibly wide range of features and virtually unlimited storage capacity. The four tabs on top are still present, albeit slightly redesigned, and provide access to the Phone app, Groups, Contacts and Favorites. Tapping on a contact reveals all the details available. In Ice Cream Sandwich fashion it shows only two tabs (used to be four). The first one is the About tab, which shows the person's photo on top. If configured, the right tab displays their latest updates from social networks or Google Talk. The in-call quality of the Samsung I9300 Galaxy S III was really good with a crisp and loud sound. Reception was also problem-free and we didn't suffer dropped calls though in areas of very poor coverage the sound would occasionally break up. 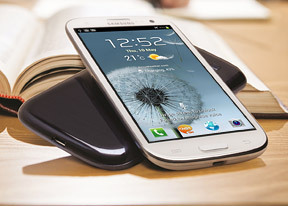 One of the features that debuts on the Galaxy S III is Direct Call, which lets you dial a number by lifting the phone up to your ear while browsing contacts or reading/composing a message. Voice dialing is available too and taken care of by the newly added S Voice, which activates on a double tap of the home button. All you need to say is "Hi Galaxy" and speak your command (e.g. "call Dexter"). Or "play " and off it goes. It takes a while to process voice commands but it has more uses than other voice-recognition apps for Android. We are going to look at S Voice in full length later on in the review, but in short its Samsung's answer to Apple's Siri and it gets the job done, though not without hiccups. We also ran our traditional loudspeaker test on the I9300 Galaxy S III. It scored a good all-round mark, meaning more often than not you'll hear it, save for the noisiest environments. More info on our loudspeaker test as well as other results can be found here. What will come in good use, however, is the new Direct call feature. When you are reading a message from someone, their number will be automatically dialed by just lifting the phone up to your ear,. The Galaxy S III also features a combined inbox, which brings together all your mail in a single folder. This can be quite handy if you have lots of accounts and you just want to check if there is a new message needing your attention. Turning the phone landscape activates the split view - the left side of the screen shows the list of emails, while the right side shows a message. This is the same kind of interface we've seen on the Galaxy Tab though the bigger screen there made it actually useful - half of even a 4.8" screen isn't enough for comfortable reading. Text entry is handled by the standard Samsung QWERTY keyboard, which offers very big and comfortable keys. In landscape mode, the keyboard takes up most of the display and the even bigger keys make it one of the most comfortable virtual mobile keyboards around.